Thanks again to Tommy Botello for taking some time out of his own trip to take some behind-the-scenes images and video. Very much appreciated! Another early alarm started the day, but at this point in the trip I was starting to hit the snooze button once or twice before getting off the sofa bed! My entire body was very much aware of the previous day's trip to Angel's Landing. I gradually got going and the three of us packed up the car and headed into Zion. Today would be something different for me, actually getting to drive in Zion Canyon. My previous trip here was all during shuttle bus season. It was a new experience driving down the canyon. I had to always be on the lookout for deer and the even more dangerous cars who stop to look at deer! Seriously, they are just deer. It was fun to make the drive myself, but I did miss the bus narrator. "This IS The Court of the Patriarchs..."
I wanted to make sure and have an early start, not just for photographic reasons but to also make sure we had a parking spot at the entrance to the Narrows. We arrived to a mostly empty parking lot, loaded up our gear, and set out. Today was going to be a busy day. There were three shots I hoped to get, and this meant I had to be quick loading and unloading my pack. My first shot was one that was in a particularly dark bend of the Narrows. I had scouted out a horizontal image that, at least in my mind, would be dark and mysterious. As we rounded the last bend before my shot, someone was already set up almost EXACTLY in the spot I had scouted. What are the odds?! As I got closer, I could tell it was someone shooting a beautiful wooden 4x5 camera. Another large format guy! Turns out it was a photographer named Justin Nambiar (Justin's fantastic work can be seen on his blog at https://jnambiar.wordpress.com) I stopped and we talked a bit about film and camera stuff. I told him I had actually planned to take the same shot he was taking. He graciously told me to feel free to set up beside him; however, I didn't want to be "that guy" so I decided to move on and let him shoot in peace. I've got to be earlier next time; shouldn't have hit that snooze button! Of course now I needed a new plan. I continued further up the Narrows into an area I had never been to. A bit past the previous spot was an even darker corridor with a series of "fins" on one side of the wall. These rock outcroppings were being lit by a pretty intense (but still dim) glow that was causing a huge contrast between the light and dark areas. This was definitely going to be my shot. I spent about 10 minutes looking around for a composition. At one point, there was a series of rocks that formed a relatively straight line with whitewater cascading toward the lit wall. I composed so that this line of rocks would anchor the lower part of my image, and the whitewater would draw the eye toward the wall which traveled left to right across the composition. Now there was the matter of exposure calculation. Because it was such a contrasty scene, I immediately thought to load up some Kodak Ektar which would be able to handle the contrast with no problems. After factoring in my polarizer and reciprocity, my exposure time was 7 minutes! It was VERY dark. I shot two sheets of Ektar, giving the second one some more exposure time...just in case. Then I had a wild thought; I wonder what Velvia 50 would do with this scene. Just for fun, and mostly just to see how the transparency would turn out, I loaded up some Velvia 50 and metered at a whopping 14 minutes! Well, there's only one way to find out. I tripped the shutter and waited. And waited and waited and waited. After standing by my camera for about 7 minutes, I got bored and hiked a bit up river to where my buddy Marc had set up. I found that he was waiting for me to finish and pack up so he could take a shot. I told him I was now about 10 minutes into a 14 minute exposure and would soon be out of his way. As I hiked back to my camera, the thought occurred to me...I have NO IDEA where my dark slide is!!! Normally I pull it and kind of stick it under my left arm while I'm exposing. Had I raised my arm up at some point and let it fall in the river? That seemed a bit careless even by my standards. As my exposure ended, I closed the shutter and pulled my tripod to the side, out of Marc's way. I frantically searched my gear, but it was nowhere to be found. As long as the shutter was closed on my lens, the film was safe. Eventually though, I would have to break down my camera. Should I pull the dark slide on another sheet of film to sacrifice it and save this one? What do I do?! As I was considering my options, I looked at the back of the camera and noticed my film holder...with two perfectly good dark slides still in place. I had just spent nearly a quarter of an hour exposing a scene and had forgot to pull the dark slide out before I tripped the shutter! To make matters infinitely worse, it was at this EXACT moment that Justin just happened to be walking by. I had just finished telling him that I couldn't find my dark slide. Once I discovered what I had done, I did my best to hide away my camera from view, but he had to have seen it. Oh well, if you're going to do something stupid, you might as well have an audience! I sheepishly returned my camera to its position, recomposed, and refocused. One pulled slide and 14 minutes later I had my image. I'm really glad I took this experimental image too! As it turned out, I didn't give enough exposure to the shadows in my Ektar shots. The Velvia turned out much better. I'm so glad that Justin had set up at "my" first location that day. If he hadn't, I never would have taken what turned out to be one of my absolute favorite images from the trip. Funny how things work out sometimes. I named this image "Through a Mirror Darkly" because first, it was VERY dark. Second, it is looking back from the opposite side of the original image I had intended to take, a mirror image of what I had originally intended to take. "And now we see but through a mirror darkly..."
With my first image in the books, I started to make my way back down river. Marc and Tommy had opted to explore further up river. My shenanigans with the Velvia had put me arriving at my second location a bit later than I wanted to. I quickly set up my composition, annoyed with myself for once again having to rush. It was another scene with high contrast, another dark corridor, so I loaded up my two remaining sheets of Ektar. The first exposure went off fine. Everything on my second sheet started fine, but as I went to replace the dark slide it wouldn't go back in. I tried to angle it every direction to no avail. Finally, defeated, I forced it back in and heard the film pop out. Upon examination, I discovered the slide had a crack along the bottom edge. This crack was causing the slide to catch on the film every time I tried to reinsert it. Time for a new one! It was not complete loss as I discovered some valuable information about the light and made some to-the-minute notes about when it arrives and how it moves. I really, and I mean REALLY loved this composition so I didn't want to chance only having one sheet on it. I decided then to return the following day to make sure I had it. Once again I packed everything up and headed down river to my third and final location. I had debated even shooting it though. The ruined Ektar had kind of left me feeling a bit deflated (apologies to all you Patriot fans out there). I arrived at this final location and just stood there staring at it for about 5 minutes before I eventually decided to take my pack off. I had decided that I would regret not shooting it. From previous scouting I knew exactly where to set up and what to shoot it with. For the third time today I meticulously repacked my gear and headed out. Later I would be joined by Marc and Tommy, who it turns out hiked all the way to the turnaround point for bottom-up hikers. Way to go guys! I've never been that far. We stocked up on dinner supplies once again at Sol Foods and had the nightly ritual of dinner, hot tub, and me complaining about but eventually loading my film holders. Intermission. If you're still reading, feel free to grab a snack. There's still one more day to go! The missed shot and ruined film in the dark corridor from the day before haunted me. Despite the fact that I had already taken what I knew to be several good shots already (if everything turned out) it was now as if the success or failure of the entire trip hinged on whether or not I was able to get this one particular shot. Getting this one shot became all I focused on. Even though it was an afternoon shot, as usual we headed out early. I wanted plenty of time to set up and check over my gear. The plan was to start deep within the Narrows and gradually work our way back down river following the glows. I had scouted out three locations with glows all spaced about two hours apart, so hiking and setting up could all be done at a relatively leisurely pace. It was beautifully planned out if I do say so myself! What was not so beautiful was the near excruciating pain coming from my left knee. I am very familiar with just being sore from hiking, and I could tell that this was something a bit more. At 32, was I starting to get old?! I SLOWLY made my way upriver with the current seeming to fight my every step. As we had time to spare, I came across an early morning glow that I hadn't noticed before. I had plenty of Velvia 50 for the day, so I decided to set up a composition. Besides, my knee could use a break. I worked a bit for a composition and eventually settled on one with a group of cascades in the foreground and a large wall bathed in reflected light in the background. I metered off the brightest white water, placing that value at +2 and took two sheets. Well, they can't all be winners... 4x5 Fuji Velvia 50, 90mm, f/45, polarizer, unrecorded time...probably somewhere around 3-4 minutes. By watching previous videos, I have noticed an alarming trend of me being quite negative toward my own work. I will definitely work on that in the future as I usually try to be a quite positive person. With that being said, wow, does this image not do it for me! I am a sucker for using rocks as leading lines, but the lower right tends to jut out and disrupt the scene more than lead the eye. Furthermore, I have no sense of continuity between the foreground and background; they're kind of just there. If you are reading this, I would love some feedback in the comments below. Sometimes I get too close to my own work and can't really tell. Love it or hate it, let me know how you feel. I will definitely return to this location this year as I feel there is tremendous potential here, but I need to spend quite a bit of time nailing down a composition. I packed up and continued onward. As we passed the confluence of Orderville Canyon, Marc and Tommy decided to do a little exploring. Since I took written notes the day before, I told them down to the minute when the glow would arrive...super proud of myself! I went ahead and set up my gear. I do want to explore Orderville Canyon this year though. I don't know if there are any photo opportunities, but it looks like a cool little slot canyon. Here is where the trip got weird for me. Having already set up, I watched the back wall of the corridor illuminate. It's a really cool scene to watch unfold. As the glow is getting good, direct sunlight hits the right wall. You think the shot is over, but after about 10 minutes it disappears and shooting conditions are perfect again for another 10 minutes. The light repeats this entire process one more time but the second shooting window is much shorter...maybe 5 minutes. After that, the direct light spills onto the canyon floor and that's when it's time to pack up. Man, the Narrows are so cool!!! The scene is absolutely stunning. A perfectly placed set of cascades and fault lines in the lefthand wall draw the eye through the dark corridor to a brilliantly lit narrow back wall. I was really excited about getting this shot! As the first glow arrived, I exposed two sheets of Ektar. Just before packing up, I've developed a habit of rechecking focus and composition just to give myself a second look and put my mind at ease. I stepped under the dark cloth and to my abject horror, the entire image was blurry on the ground glass! I had absolutely no clue what had happened. Had focus shifted? I was using my 90mm lens so even a slight shift would not have led to the degree of blurriness I was seeing. I gently pushed down on my tripod, but it was stable. Besides, even a downward shift in the tripod would not have caused missed focus. Despite my best efforts, I could not trouble shoot the situation. I refocused and was only able to get in one more shot. Again to my horror, upon a second check the scene was blurry. What if my entire trip had resulted in out of focus images? I hadn't double checked every image I had taken. And what on earth was causing this? With the wind completely taken out of my sails, I very slowly packed up. We moved on to our next shot. Arriving about an hour and a half before the light, I pulled out the video kit and tried to articulate what had happened, but I was nearly at a loss as to how to describe it. I wasn't certain that everything was ruined, but I had a very sick feeling in the pit of my stomach. As I was recording, Tommy was snapping some pics. My mind was racing too fast to notice though. When I finished, I pulled out my audio recorder and kind of absent-mindedly listened to what I had just said. I love this image Tommy got of that. Through my facial expression and body language you can really tell what I was going through. Alright, time to think about this logically. I've made tons of perfectly sharp images with this setup and nothing appeared wrong. I unpacked everything and composed and focused well before the light arrived. Every five minutes or so I would recheck my focus and everything was tack sharp each time. My confidence definitely built from this. As the light arrived, I made the decision to shoot Fuji Velvia 50. The scene would definitely test its limited range, but I wanted Velvia's rendering of the intense glow. And what a cool glow! Really, really intense but short lived, this glow doesn't fade away...it just completely stops with no warning. It's literally the same as if someone shut off an orange light switch. Have I mentioned that the Narrows are amazing? :) Metering off the white water again, I got an exposure time of around 6:30. Of course during this long amount of time, lots of people walked through the image. Never really a concern unless they stand still or walk straight toward or away from the camera. As long as they are not constantly occupying the same plane on the sheet of film, I'm good. What I'm not good with is a flash, and that's exactly what happened about halfway through my exposure. I was concentrating so hard on watching people walk through that I didn't notice the couple just beside me setting up for a selfie. I DID notice the flash from their point and shoot though. Tommy said the look on my face was priceless...as if I had just seen a ghost. I quickly closed the shutter and stopped my timer. Still almost three minutes to go and it looked as if, upon review, their first selfie was not satisfactory! Eventually they left and I did my best to recall my past Zach Arias training... P&S flash is only good to about 10 feet, aperture controls the amount of flash and I was stopped down to f/45, and my sheet of Velvia 50 had been already exposed to light for 3 minutes thus reducing its already low light sensitivity. I eventually decided I shouldn't expect to see any ghosting and reopened the shutter. I named this image "Unmoved" because, to me, floating rock here kind of looks like a fist sticking up...a sign of strength. Despite how the Virgin River can rage, over the years this stronghold of a rock remains unmoved. After exposing, I held my breath upon rechecking focus. Once again it was tack sharp; my confidence returned! After repacking, we made the leisurely stroll to our final location. Again arriving well ahead of the light, I had plenty of time to compose. This last scene contains a long-lasting glow. I found it quite difficult to judge whether the light was coming, going, or remaining the same. I shot my last two sheets of Velvia and packed up. Before packing up though, I again rechecked focus. Spot on again! This completely took away all of the worry I had earlier. Who knows what happened in the dark corridor...perhaps the shot was just cursed. Yeah, we'll go with that. Of course as soon as I had everything broken down, the light appeared to get stronger. Just my imagination? I named the image "Inspiration Alcove." Several years ago, it was an image from this location by one of my favorite photographers that inspired me to visit Zion in the first place. I definitely had to have an image of this massive alcove. Despite the focus issue on the one shot, this remains the best day of shooting large format that I've ever had. Again leaving out the period of time where I doubted everything I had ever done...ever, overall it was such a relaxing day. At each spot I arrived well before the light and took my time setting up and composing; at no point in the day did I feel rushed or like I was chasing the light. I will not soon forget this experience! I had my usual dinner from Sol Foods that night...a sandwich and junk food. Back at the hotel, I once again complained about loading film, and once again I loaded it anyway. Marc and Tommy were busy uploading their images from the day. When it's all said and done, for personal reasons I find all of the work involved in large format to be more rewarding than shooting digital. I would absolutely be lying though If I said I wasn't jealous of the instant feedback they had...knowing immediately that they got their shots! Oh well, uncertainty comes with the territory. It was early to bed this night as the next day would be a big one. We were making the trip to the legendary Subway! Laurel Falls and East Tennessee Snow!!! Taking a week break from my Zion recap videos because we had a big event in East Tennessee last weekend...SNOW!!! Nothing gets Tennesseans more excited than the possibility of snow. We also tend to raid the stores for milk and bread at the first mention of the white stuff. Is this just a regional thing or do people do this in other parts of the country? I never really understood it as a milk sandwich is about the last thing I want during a snowstorm. Or any other time for that matter. Who is eating the milk and bread sandwiches?! As the forecast called for only 1-2" we decided to forego stocking up on supplies and take our chances. We like to live life on the edge like that. My family had to be in Sevierville for the weekend to attend my nephew's birthday party (he turned one...the cake smashing was anticlimactic) so I of course packed the camera gear. I awoke Saturday morning to see the ground beautifully covered in....rain. Thanks a lot meteorologists! However, I could see that the peaks of the mountains were starting to get white. I just needed some elevation. I headed out early with no real goal in mind. This is not ideal for large format photography. I thought about shooting a scene I passed on my previous hike to LeConte. However, as is usually the case anytime weather is around, the road leading to this trail (Newfound Gap Road) was closed. I needed a new plan; in fact, forget a new plan, I just needed A plan. At the beginning of last year, when I really decided to commit to large format, I made it a goal of mine to photograph all the major waterfalls in the Smoky Mountains. On that list Laurel Falls was one I dreaded the most. To say Laurel Falls is crowded is a gross understatement. At 1.3 miles, paved, and gently ascending, this trail is certainly very popular. Compositions are also extremely limited because the park placed a bridge at the base of the falls. Seriously. You can basically touch the waterfall from the bridge. On this morning though, I thought the snow meant I could at least catch a break from the crowds. Also, the snow meant I would have a somewhat unique image of a location that really doesn't lend itself well to unique photographs. As I drove toward the parking lot for the trail, the snow line was pretty distinct. Within about a quarter mile of driving the ground went from completely bare to covered in about 2 inches of snow. It was definitely pretty, and with a goal now in mind, I was excited to take an image. I pulled in the parking lot and was disappointed to see that there were already two cars there. I loaded up and hit the trail. I quickly passed two hikers (sometimes I race-hike...no big deal) as I set a fairly quick pace in order to stay warm. I was the first person to arrive at the falls that day. I crossed the bridge and took off my pack, resting it on a bench just beyond the bridge. There would be no wilderness experience today! One thing I had not anticipated was the amount of snow that was falling from the sky. It was REALLY coming down at this point! As you can imagine, water and wooden film cameras do not play well together. I did my best to keep everything covered, but it was impossible to keep it dry. As I set up and composed, I became a bit concerned about how I would keep my film dry. Hiker: Wow, that's a big camera! You must be serious. Me: Thanks! It's a large format film camera. It shoots sheets of film. Hiker: Nice. Does the image pop up on the back of the screen when you take a picture. Hmm... I don't think people remember what film is all about. (Sidenote: Has there ever been anything take over/change an industry as fast and completely as digital cameras have done with photography? Smart cell phones maybe.) The snow eventually subsided enough to where I felt it was safe to take a shot. As I was still a bit unsure what the snow would do to the shadow areas of the scene, I bracketed multiple shots on Kodak Ektar ranging in exposure time from 1 second to 43 seconds. If you've ever shot Ektar you can probably guess which shot turned out best. I also took 2 exposures on Ilford Delta 100. I really thought I would like this scene in black and white, but I didn't much care for the monochrome shots. I think it's because snow is almost monochrome already so seeing it on black and white film doesn't add anything to the scene. Weird. A few thoughts about Kodak Ektar. (If you're not a film or large format photographer, you'll probably want to skip this paragraph.) A year ago I hated, and I mean HATED this stuff. So many people raved about it, particularly it's huge dynamic range, but I couldn't scan it if my life had depended on it. I kept getting these weird color casts and horribly washed out images. It made me rage-quit photography on multiple occasions. I had to shoot it though because my other color film, Fuji Velvia 50, can only be shot in limited circumstances. So I stuck with it, and now I've got to say I'm completely confident in it. Here are a few things I've learned about it in the past year. First, NEVER underexpose it. Your scans will look terrible. When in doubt, always err on the side of giving it more exposure time as you will almost certainly not be able to blow out any highlights with this film. In my opinion, you have to meter as carefully for the shadows in Ektar as you do with the highlights in Velvia; do not let the shadows go beyond -2. Second, expect to spend some time with levels and curves to correct color casts. This is just part of shooting color negative film I believe. Once I understood those two things, I have come to absolutely love this stuff. It is every bit as sharp (if not sharper) and finely grained as Velvia 50. It's dynamic range is as advertised too. When exposed correctly, I have seen it hold detail across 10 stops; that's a really big deal. So back to the falls. It had been almost an hour from the time I set up until I took my last exposure. That's a long time to stand still in cold weather, and my hands were really starting to feel it! I only wore a thin pair of SmartWool touchscreen compatible gloves. Since I use my iPhone so much when shooting large format, these gloves are a must. For the most part when I'm hiking and my heart rate is up, this is not a problem. However, when I'm standing still and I've had to dust snow off my gear, it's a different story. I don't think my hands have ever hurt as bad as they did that morning! I actually ran part of the way back (the snow had now melted on most of the paved trail) just to get my blood circulating again. By the time I returned to my car, they didn't hurt quite as badly. I bundled her up as much as I could (long sleeved t-shirt, thin pants, and a hooded vest...no gloves) and we headed back out. I was hoping that driving in the snow would be enough for her, but it wasn't. So we pulled off at one of the "Quiet Walkways" that are everywhere in the Smokies and did some "hiking." We walked down by the river and threw some rocks in...her favorite pastime. There were a few other people there and I could feel their judgmental stares. "Does he not know how to dress a child?" their looks said. She had a blast though! As all good things must eventually end, she told me she was cold after about 30 minutes so we hopped back in the car. In what I'm sure is completely unrelated news, Addison has been sick all week and had to visit the doctor twice. All you guys out there who thought about competing in "Father of the Year" might as well just give it up...I'm pretty sure I've got that one locked up! Another day photographing in Zion meant another early alarm. Today's weather called for a mostly cloudy start that would be clearing throughout the day. This meant all shots in the Narrows were off for today. I did have a shot in mind that would benefit from the clouds though. A few months prior to the trip, I envisioned a shot atop Angel's Landing. I wanted it to be an early morning shot as the low angle of the sun would cast shadows on the canyon floor giving it a real sense of depth. I termed this a "personal" shot as I had planned to hang it in my office. If I can't be close to Zion, at least this would be a good way to see it everyday. I thought a shot of Zion Canyon would be the best reminder of this magnificent place. While the sky wouldn't be a major part of this image, clouds would definitely bring some added interest. We started the morning driving to the Zion Museum. This was the last day of the year that the shuttle buses would run, and the museum is one of two places you can park to catch a ride. Behind the museum sits one of Zion's icons: The Towers of the Virgin. It is THE place to watch sunrise here, almost equally as iconic and accessible as the Watchman at sunset. All you have to do is walk in an open field behind the museum. Oddly, despite the fact that it's a shot everyone has seen, I have no aversion to shooting it like I do the Watchman. There's just something about the sun rising and watching the light slide down those massive towers. Even with other photographers around, the early morning makes for a much more peaceful and subdued environment. I could honestly watch sunrise from this spot everyday. Well, except for this day...because when we arrived there was no sunrise. The clouds that I thought may provide some real drama were actually too thick; no sun was getting through. I was content to wait for the buses, but as we were waiting the clouds started to clear. I still wasn't convinced to take a shot. It's honestly a bit hard to get motivated to unpack everything this early in the morning! However, Marc and Tommy convinced me that I would regret it if I didn't shoot it, and I'm glad they talked me into it! I quickly unpacked everything, and by the time I was set up, the sun had started to catch the tops of the towers. From having taken this EXACT same shot on digital a year prior, I knew that at one point the shadow of the peak behind us would line up with the Sundial peak. I waited for the right moment and clicked the shutter. Even though it was an extremely high contrast scene, I shot it on Velvia 50. I wanted to really accentuate the orange/red cliffs. I used a two-stop hard graduated neutral density filter to help bring in some foreground detail. One interesting thing about large format; due to the "sensor size" of the film, even hard edge ND filters will blend smoothly (even at small apertures). This is really helpful when shooting uneven horizons. In fact, I've found soft edge ND filters to transition too smoothly to be useful for large format. I bracketed three sheets because the light was so extreme, but my normally exposed sheet ended up being perfect. Also, each day I brought along a 35mm Canon Rebel loaded with some Kodak Portra to capture some behind the scenes pics; I shot some of the roll this morning as we were setting up and shooting. Once the cliffs were fully bathed in light, we packed up and loaded onto the bus. Next stop was the Grotto and the start of the hike to Angel's Landing. There are several warning signs at the beginning of the hike. Angel's Landing is a bit strenuous, and if you have a fear of heights, don't even think about it. I'll be honest, I was a bit surprised at how tough the hike was with a pack on. It's a 5 mile round trip hike that gains just under 1500 vertical feet. I had trained on a hike in the Smoky Mountains, the Chimney Tops, that is actually supposed to gain more elevation in the same distance. Angel's Landing felt quite a bit harder though. Starting along the Virgin River on mostly paved trail, you quickly gain elevation through a series of switchbacks. About a mile into the hike, you get a reprieve from the upward ascent in Refrigerator Canyon. This relatively flat stretch of the trail offers a lot of shade to cool off during the warmer months. The break is short lived though as you'll soon come to Walter's Wiggles, a series of 21 short but steep switchbacks. The wiggles end at Scout's Lookout on the West Rim of Zion Canyon. This is a nice place for a break and offers some spectacular views in its own right. If you are even remotely afraid of heights, Scout's Lookout will be your turnaround point. The remainder of the hike to the top goes along the spine of a sandstone spire. Your method of traveling is now more scrambling upward than it is hiking. In some cases, the trail is only a few feet wide, with sheer 1000 foot drops to either side. The park service maintains a chain system to hold on to so that does provide some relief from the heights. Any way you look at it though, it's a tough slog both mentally and physically. Moving along at a rather average pace, we made it to the top in about half an hour (from Scout's Lookout), and the view was as advertised! The top "platform" is a relatively flat area that's maybe 50 yards long and perhaps averaging 20 yards wide. Oh yeah, it's also super windy! The wind was expected though as that's pretty much the norm for mornings in Zion. Photographic compositions are a bit limited. Anything in the foreground is tough to include as you'll have to stop down pretty far for depth of field; with canyon walls, canyon floor, and sky included, camera movements are not of any help. Of course, because of the wind the longer shutter speeds make stopping down all but impossible. However, I wasn't after a compelling foreground. I wanted to capture as much of Zion as possible so I could hang it on a wall for a daily reminder of this place. I took two shots, one facing up canyon and one down. The up canyon shot is the better image here. For one, it shows the entrance to the Narrows, a nice touch considering it's my favorite hike. The clouds could not have cooperated better either. Beautiful white, puffy clouds perfectly aligned in the scene! The sky was also that brilliant shade of cobalt blue you can get in the desert on clear day. I used a red filter to make that go almost black and really make the clouds pop. As I'm sitting here typing, I'm staring at it, and I love the reminder it gives me of Zion. The shot looking down canyon is alright, but the clouds weren't as cooperative. Also, I had some depth of field issues because more foreground is included. It's alright at smaller sizes, but gets soft when you look at it closely. We started the hike downward, and from reading reports online, most people consider this tougher than the ascent. I did not find this to be the case at all though. Perhaps it's because I don't fear heights or maybe it's the 45 pounds of stuff strapped to my back. Either way, going downward was much easier. We stopped on a rather large ledge just above Scout's Lookout for a bit of rest and water. By now, the day was getting pretty hot! I took the obligatory selfie, and then continued back to the canyon floor. We arrived back the the Grotto bus stop intact, but exhausted. We had thought about doing Subway the next day, but based on the way we all felt that wasn't a hike we wanted to tackle without some rest. We went back into Springdale to grab a late lunch and then decided to travel the Mount Carmel highway to explore some of the eastern parts of the park. This iconic drive offers spectacular views of Zion Canyon as you drive. A few miles in, you'll come across the Mt. Carmel tunnels. When you really think about it, these are tremendous engineering accomplishments. One of the two tunnels is over a mile long! Don't think too long about it though because it's also quite terrifying! That's a LOT of sandstone you're driving underneath. One of my favorite aspects of Zion is simply the variety of landscapes you come across. The eastern high country is vastly different from Zion Canyon. Instead of vertical walls, you are treated to steep hills of white and orange striated sandstone. There are many "washes" full of maples and cottonwoods. While there are far fewer trails, this open country is readily available to explore. We pulled off on the side of the road and just hiked around for a bit. One shot that caught my eye was a sandstone abstract showing just the striated lines. I'm honestly not great at visualizing abstract scenes like this, and I think this image shows it. It's definitely something I've got to work on as I think there is vast potential in this part of the park. Something to shoot for next year! The night ended with a routine trip to Sol Foods, the local grocery store, to grab some dinner. Fun fact, locals have a "Local Card" that gives a discount on groceries. I've got to get my hands on one of those cards! Back at the hotel, the previously "Closed for Maintenance" hot tub was back up and running! Couldn't ask for a better way to recover from a hike to Angel's Landing. I awoke before sunrise after what can only be described as the best sleep anyone has ever had on a pullout sofa bed! The previous day's travel had really left me exhausted toward the end of the day, so I was relieved to wake up with energy. Marc, my friend from Canada, had left about 4 that morning to drive up to Dixie National Forest. He was wanting a morning shot of the Aspens, so he left early with the hopes that there would still be leaves left on the trees. This early in the morning we essentially had the bus to ourselves, so stashing packs in an empty seat was not an issue. We eventually made it to the Temple of Sinawava, the last stop on the ride and the entrance to the Narrows. We loaded our water bottles and were quickly on our way. It was a typical Autumn morning in Zion. A bit chilly (the River Walk hike quickly took care of that) and windy. Not quite sure what causes the consistent early morning winds; I think it may have something to do with air masses of different temperatures filtering through all of the narrow canyons. I cannot adequately express how excited I was to return to the Narrows. It is without a doubt my all-time favorite hike. Subway may have a bit more stunning scenery crammed in the last half mile, but the Narrows wins for consistent, awe-inspiring imagery. I still vividly remember the first time I set foot in those frigid waters the year before. Being completely honest, I didn't stop grinning ear-to-ear for the first mile in. Had to be goofy looking, but I didn't care! The only word I can think to use to describe it is 'magical.' You've got this weirdly powerful river. It has carved a thousand foot deep gash in the rock and can rage during flash floods yet, most of the time, it's gentle and shallow enough to walk through. The river can run wall to wall and yet still provided space for neon yellow cottonwoods to grow. Finally, the icing on this magic cake is the light. In many places, the walls are so narrow that the sun cannot reach the bottom. Instead, light reflects off one wall and illuminates another...giving the all important reflected light glow. As the sun moves throughout the day, glows can appear and disappear giving you a new experience depending on when you hike it. When planning our trip, we had hoped to hit fall color at its peak, but upon arriving we found many green trees in the canyon. Not too big of an issue in the Narrows as there are many shots that don't require foliage, just rocks, water, and orange walls. Today would be mostly a day of scouting, although I did bring the camera along. I wanted to set up shots for the coming days, preferably ones that didn't depend on fall color. As we made our way upstream, I quickly realized I had made an error. I wore low-top shoes! I might as well have taken them off and poured small pebbles in them, because they were definitely a rock magnet. Every mile or so, I had to take a break and empty my shoes. Definitely going to change that approach this year! Reflected light glows are all different. Some are subtle...not so much seen, but definitely captured on film. The first glow I found this day was of the other variety...so bright it takes your breath away! Rounding a corner the orange was stunningly bright. Better yet, for some reason there was a huge cottonwood tree close by that was in full color! Despite this being a scouting day, I can set my camera up fairly quickly so I decided to try and work out a composition on the spot. The first shot of a trip is very important to me. I often feel self-induced pressure when shooting. I find that getting this first shot under my belt, much like a golfer getting the first drive of a round over with, helps ease my tension. This shot was no different. I found that I fumbled around with my gear more than normal while setting up. Composing was also an issue as I never could seem to get it exactly as I wanted. For starters, try as I might, I could not find any composition that included that beautiful cottonwood. Once I decided to scrap that, I found that I could never get my tripod arranged correctly around the rocks. Ugh! I finally took the shot, more out of frustration I think than anything else! Another thing about first shots; without exception, I hate them as soon as I click the shutter. In fact, later in the day I described it to a friend of mine as "composition wasn't great; it's just a color vomit shot." That wall was REALLY orange! I think I'm so focused on getting that stress out of the way that there is no room left for enjoyment. Remember, these trips are supposed to be for fun! However, upon reflection my mind usually changes. After having nearly 3 months to think about it, I really enjoy this image. First, it was the perfect scene for Velvia 50 with only 4 stops between the white water and the darkest shadow. Secondly, the composition I struggled so much with actually conveys what I want it to. The foreground rocks really anchor the scene while the white water takes the viewer back and up toward that beautiful orange wall with the hollowed-out feature. I called the image "Chance Encounter" because coming upon a strong glow like that and being able to shoot it is really lucky! The rest of the day would be spent scouting. I did expose a second shot, but by that time clouds began to roll in. Clouds are like an 'off' switch for reflected light. Once the sun is blocked the walls will not illuminate. My exposure was good, but the shot was a dud. I wasn't bummed though. I managed to get my first shutter click out of the way, and I made note of a total of three more shots I wanted to get. Success! That evening we rejoined with Marc, who found the Aspens were sadly devoid of all leaves (much higher elevation than Zion). As clouds crept in, they shot the Watchman while I hiked down river to video my closing for the day...making sure to be completely hidden from the bridge crew! If you've been to Zion, you know the deal. (Funny thing about the Watchman. I attended the Ben Horne School of Zion, so it's against my religion to take that shot. Yet, I will gladly stand shoulder-to-shoulder with other photographers to get sunrise on the Towers of the Virgin. Weird the photography rules we make for ourselves...) I could not ask for a better first day of shooting! I got a shot that I would eventually love, and the rest of my shooting time started to take shape. "So...where are you going with all of this?" It's a question I'm getting a lot lately. Where are you going with landscape photography? What do you hope to accomplish with all of it? I wish I had a clear answer. A master plan about how I was going to take the photography world by storm using an outdated camera and shooting nothing but nature. In actuality, it's a bit more complicated. The truth is, I have no idea where I'm going with landscape photography. While I probably shouldn't admit that in public, it is in fact the truth. When I think ahead to where I want to be with landscape photography in a few years, my mind is literally a complete blank. Normally when I set goals, in my mind there is a clear ending point. A few years back, I set a goal to become an instrument rated pilot. Even during my first few flight lessons, when I felt completely overwhelmed by the plane, I clearly envisioned myself as a pilot. I knew through hard work and study that I would achieve my goal and a year and a half later I was flying approaches on overcast days as an instrument rated pilot. That's the way setting goals for me has always worked, so it's a bit strange that I cannot mentally project where I eventually want to be as a landscape photographer. I suspect it has something to do with my ideal job. In a perfect world, I would be a professional landscape photographer. I would spend most of my time in the field shooting. Since this is the ideal world, even though I'm out in the field quite a bit, I still magically get to spend time with my wife and daughter. When I return from shooting, I have loads of gorgeous images that sell for enough money to support my family. I don't spend any time marketing my work; my days are filled only with exploring and shooting. The one slight problem with my ideal job is that it doesn't exist...a minor detail really. If you broke down the current job model for a professional landscape photographer into a pie chart, actual time spent shooting in the field would be a small portion of the pie. Instead, most time is spent marketing yourself, leading workshops, selling prints here and there, and doing other various tasks to earn an income. Here's the deal...I have no interest in everything else that goes along with being a landscape photographer. Let's start with workshops, a sometimes controversial topic. I've actually been on one workshop, and it was absolutely the definition of a train wreck. However, I like the photographer who led it, and I do feel I gained some things from the workshop, so it wasn't a total loss. I'm not vehemently opposed to workshops and those who lead them, but I'll probably never go on one again. It's just not my style of learning. Speaking of styles, mine is not conducive to leading workshops either. Can you imagine how upset people would be if they paid thousands of dollars to follow me to a location and then wait, sometimes for hours, until the light arrived?! Hoping for one good shot per trip is not what most workshop participants expect...or deserve, honestly. I can't even begin to think about all the pressure I would feel! It's not that I don't like being around people either. On the contrary, when I'm out shooting I do enjoy chatting with people who are curious about my camera. It gives me something to do during my down time. I also enjoy talking to other photographers, especially large format guys. While I love these interactions, at some points during all trips I need some time alone to connect with the land...to soak in all of its sites, sounds, and even smells (Ed: My goodness I'm starting to sound like a hippy...). Having to entertain a group of people for several days is unappealing to me. The thought of being that close to nature while not being able to peacefully take it all in would honestly be more upsetting than being stuck in the city. I'm also not good at marketing myself. Partly because I'm not comfortable with it, and partly because I don't really have a mind for it. My background is not in business, so advertising is not my strong point. Added to this is the fact that, let's face it, I've got a strange portfolio of images to market! Who else shoots East Tennessee and Southern Utah?! I'm constantly battling the thought that my images don't really have a home. I find it fantastic (insert sarcastic voice) that my weakest area (marketing my work) is the most important in making landscape photography a viable profession. Look at Peter Lik for example. I have no doubt that if you took images from my Zion portfolio and put his name on them, they would sell. And sell for quite a bit, if his marketing numbers are to be believed. That's not being conceited either; you could take the work of MANY photographers and do the same thing with Lik's name. Say what you will about the man (and I've got a future blog doing just that), but he is a marketing genius. So I'm probably never going to be a full time landscape photographer...where AM I going with this then?! For starters I do have smaller goals. I would like to get my work "out there" more this year, and I've started taking steps to do that. Last month I entered some work in a contest, winning first in landscape and second overall. (Somewhat ironically I won an Epson large format printer...after having purchased a MASSIVE printer one month prior.) I am also awaiting word from several local art exhibits where I'm quite optimistic that my work will be on display in the spring and summer. And while teaching via workshops is probably not in my future, since I enjoy learning online via blogs and YouTube, I am trying to pass along experiences I have using those platforms to share trip reports and tutorials. It's encouraging to win competitions and to see my blog and YT following grow, but honestly it's not the best way to make a living and spread my work. I'm not exactly targeting the correct market to sell, and print sales are currently modest at best. Also, I'm still waiting for the millions of dollars to arrive from YouTube ads. (Perhaps they lost my address...) Selling more prints is definitely a goal of mine, and I will continue to work toward this. However, if it never takes off it won't change my attitude toward landscape photography one bit. My main goal is, and always has been, to get out and experience (and hopefully capture on film) this beautiful world we live in. Where am I going with all this? Wherever my next hike takes me, that's where! Look at that saturated goodness! Happy New Year everyone! No blog post last week as I was busy spending quality time with family to celebrate Christmas. Speaking of Christmas, my wife got me not one, but TWO boxes of Fuji Velvia 50! This should last me the year...although I might purchase another box in the fall just to be safe for my annual Zion trip. With regard to Zion, I hope you all enjoyed my intro video and blog to this year's trip. I stayed a total of 8 days this year and plan to release a video from each day. My hope is to put out one video per week for the next little bit, but right now I'm actually waiting for some more film to return from the lab. These aren't landscape shots, but some behind the scenes work. I took an old Canon Rebel and shot a roll of 35mm Portra of the trip. Once those scans return (I'm too lazy to scan my own 35mm color negative!) I'll get back to posting daily recaps. In the meantime, I've been anxious to get out and shoot again. I haven't taken a single shot since the end of October! It's a strange reality to take so many shots in a short amount of time (52 total sheets in a little over a week at Zion) and then be completely shut down for months at a time. Therefore, I made it a goal of mine to shoot something over Christmas break. This meant a trip to the Smoky Mountains was in order. If I'm being honest, I'm not all that inspired to shoot the Smokies. I'm not quite sure what it is. Perhaps it's just familiarity. After all, I have grown up here nearly my entire life. Rolling hills covered in trees are things I've seen for as long as I can remember. It could also be the people. (That sounds mean...) The Smokies are the most visited National Park in the US...and it's not even close. Last year, more people visited there than the next two parks (Grand Canyon and Yosemite) COMBINED! The previous year, it was more than the next 3 combined. If you like being completely stopped in traffic, then I highly recommend visiting in the fall on a weekend. Finally, I just don't connect with the scenery as much as I do in the Southwest. There are trees; trees everywhere! There are very few "clean" views to be had, and when you do come across one during a hike, there is often no photographic composition. And it's not just me who thinks this way. (My elementary school teachers taught me to never start sentences with "and" so technically I do know better...) Ansel Adams himself once said, "The Smokys are OK in their own way, but they are going to be devilish hard to photograph." Perhaps that's why he only came here once. However, Ansel lived near the Sierra Nevada, and I live in East TN. It's the closest park to me (essentially in my backyard) and I do find the Smokies beautiful in their own way, so about a year ago I made a conscious effort to shoot there more. I chose to hike to Mt. LeConte early on the day after Christmas. LeConte is one of, if not the most famous landmarks in the park. It's the third highest peak (if anything here can actually be called a peak) in the park, and there is a lodge at the top where people can stay overnight during the warmer months...as long as you make reservations well in advance! There are four (technically five if you count two trails that join before the summit) separate trails to the top. I decided on the Alum Cave trail as it's the shortest trail and set out early in hopes to avoid the inevitable crowds. I arrived at the trail head just before 8 a.m. and 29 degrees outside. Sometimes the hardest part of the journey is just getting out of the car, even when you know you'll be warm after about 10 minutes of hiking. I eventually built up the courage to turn the car off and hit the trail. I had the entire mountain to myself! A light snow covered the rhododendron as I made my way upward. It was really quite beautiful! After about 45 minutes of hiking I came to an arch. An actual arch! My own little slice of Utah right here in Tennessee. Another prominent milestone along the hike comes at the halfway mark: Alum Cave. Not really a cave, Alum is a 90' high, 500' long overhang that stays completely dry underneath. It's an excellent spot to rest; some people even turn around at this point. I highly recommend continuing. Just past the "cave" the hike starts to gain some elevation. Soon, you'll start to rise above the surrounding hills. By midmorning, the sun had melted most all of the snow. The warmth was nice, but it made me realize I had underestimated the water I would need. This is something I do with alarming frequency. I just find it hard to pack a second liter of water when my pack is already so heavy. I conserved as best I could during rests and slowed my pace a bit. My pace would be further slowed by the last half mile of the hike. It was a solid sheet of ice. And I mean solid. Thankfully, the park has installed wire cables to hang on to, but it took every bit of concentration I had just to stay upright. I slipped numerous times but thankfully never fell. Unfortunately, my pace slowed to a crawl. I finally reached LeConte Lodge, but a five mile hike had taken me almost 4 hours! I started to become a little concerned about remaining daylight. I am always prepared to hike in the dark, but hiking in the dark in an ice field was quite unappealing. Further complicating the situation was the fact that Myrtle Point (a well-known overlook near the summit) was another .7 miles away, over more ice. The top of LeConte, just like the rest of the entire park, is covered in thick trees. At one point I was literally at the peak, the ground fell away from me on all sides, yet all I could see were trees. Therefore, I knew I would need to reach an overlook to have any chance at a shot. At this point a bit of psychology came into play. I was not expecting to take an award winning image here, but I felt that I needed SOMETHING tangible from this trip for all the effort I put in! With water, and now food, running low, I knew that I needed to take a shot to feel some sort of accomplishment during my return hike. Therefore, I made the decision to continue on. I quickly packed up following the shot and started to head back. It was honestly one of the least satisfying shooting experiences I've ever had. Fortunately though, the afternoon temps had started to melt the ice which allowed for much faster hiking. I even got to explore the lodge. Sweet! What wasn't so sweet was that I bit it, HARD, about a mile past the lodge. Even better, I fell in front of a total stranger. I went nearly 8 miles without falling and without seeing anyone, but the first time I'm close to another hiker, I fall. Fortunately I shielded my gear from the fall with my knee and hand. I really miss hiking in my 5.10s; they would grip anything. My pride and gear were both barely still intact, so I continued onward. At about the 3 mile mark on the return I really hit a wall. My knee had a golfball size knot, and I was really starting to feel the effects of dehydration. I took a LONG break at Alum Cave, where I finished off my water while listening to 3 people discuss how "age was just a social construct..." I don't think I have much in common with this group. The remainder of the hike was uneventful. I even got my second wind and was able to hike back fairly quickly, with plenty of daylight left to spare. I looked rough though. I took a selfie at the car to commemorate the event. Funny how I only take selfies when I shoot large format; perhaps because it allows for so much downtime...weird. The next day I developed and scanned the film, and I really enjoy this shot. I've tried to separate the image itself from the effort it took to create it, but I think it stands quite well on its own. I still prefer the Southwest (and I probably always will) but I am slowly making peace with these hazy rolling hills. It's 4:30 a.m. and there is an incessant alarm coming from my phone beside my bed. Who wakes up this early for fun? Better question, who goes to bed at 1:30 a.m. knowing they have to be awake to travel in three hours? Unfortunately, the answer to both of those questions is "me" and this is how I started my 2014 trip to Zion National Park. Clearly I need organizational help. I find it somewhat ironic that a trip to a place where most people find their Zen started off with such a chaotic feeling. I had been eagerly anticipating this trip almost since the day I left Zion a year ago. My first photo trip there was such a great experience I immediately decided to return the next fall. This trip, however, was going to be a bit different. I was going to be shooting strictly 4x5 film; all digital cameras (save for a GoPro and iPhone) would not be making this trip. I felt confident in my abilities with this format, but still a bit anxious to be placing so much importance in a format where so much can go wrong. In fact, just before I left my wife asked me, "Are you SURE you don't want to take the digital camera?!" Gotta love the vote of confidence before I left! Eventually, after triple checking to make sure I didn't forget anything, all gear and clothes were packed. I settled into bed and then, almost immediately, woke up and hit the road a few hours later. I made the short drive down to Chattanooga where I met my friend Tommy, who would be joining me on the trip. It's always nice to travel with friends...the offset rental car and hotel price aren't bad either! One question I often get is, "What's it like to fly with film?" The big concern is sending film through the scanner and exposing it to radiation. Online, the TSA says you shouldn't worry about film as long as it's slower than 800. Nothing I had is faster than ISO 100 (or should I say ASA 100?) but I wasn't taking any chances...especially with my precious supply of Velvia 50. I asked to get my film hand checked, explaining that I didn't want to risk anything because Velvia is no longer made in the US, and they were extremely accommodating. The agent swabbed all of my boxes of film, even the previously opened ones, and that was it! My return trip starting in St. George, UT was the same; I honestly can't say enough good things about my experience in both places. I just try to be as friendly to them as possible, and I think this goes a long way in smoothing things over. The flights were all pretty uneventful. At heart I'm still a little kid on an airplane so when I wasn't napping, I stayed glued to the window. I'm always fascinated by how the land changes so drastically as you fly west from Atlanta to Utah. On our last connecting flight from Salt Lake City to St. George, we were on a much smaller plane so my camera suitcase had to be checked at the gate. I was a bit anxious having everything out of site, but it all arrived safe and sound. Also, that flight goes flies directly over the western border of Zion. If you sit on the left side of the plane, you'll have a spectacular view of the massive finger canyons in the Kolob Canyon section of the park. Months ago, I may have booked a seat on this side of the plane for that very reason...like I said, kid at heart! We arrived in St. George around noon and checked out our rental car. It's about an hour drive from the airport to the park, but if you know what you're looking for, you can see the distinctive cap of the West Temple while you're still at the airport. This is when I first started to feel that nervous excitement of a shooting trip. Up until this point, I had been too tired! Now, Zion was in sight. Time to get into photography mode. We would be staying at The Desert Pearl (highly recommend this hotel btw) Inn in Springdale with Marc, the third member of our group. Since he was arriving a bit later, and the hotel was in his name, Tommy and I ventured into Springdale to kill some time. We stopped by Zion Adventure Company to check out some gear. Last year I rented some dry pants for the Narrows and intended to do the same this year, but they were selling off their old inventory. It was cheaper to buy than rent, so I picked up a pair. The only caveat to this was that the pants had not been checked for holes. Spoiler alert: mine had a hole which I discovered the hard way! After getting some supplies, we ventured into the park. Zion's beauty is absolutely breathtaking. In fact, I often tell people that on my first trip I had built up Zion so big in my mind that I thought there was no way it could meet my lofty expectations. Instead, it far exceeded them! However, despite this beauty, it is difficult to capture its scale on film. One image I had envisioned months ago to try and show this was of Angel's Landing framed by trees. Tommy and I spent about an hour looking around for the perfect tree to frame this massive peak. Google "Ansel Adams Half Dome Oak Trees Autumn" and you'll get a feel for what I was searching for. After checking out the cottonwoods around Angel's Landing, we got back on the shuttle and headed to the last stop: The Temple of Sinawava and the entrance to the Narrows. I had no intention of actually getting in the Narrows, but I just wanted to see how the afternoon sun was bouncing off the canyon walls. At this point in the day, I was actually starting to feel pretty sick. The three hours of sleep combined with 2000 miles of flying and airport food had taken its toll. We made it about halfway up the paved River Walk, and then turned around. If I didn't get food and some water soon, things were going to turn ugly! Fortunately, by this time in the evening Marc had arrived. We unloaded everything in the hotel and headed out in search of food. We decided on a burger joint called the Brew Pub. While I highly recommend the burgers, DO NOT order the shrimp cocktail appetizer...unless you like paying $14 for three shrimp. It was one of the most significant disappointments of my entire life. Feeling better, but still exhausted, we returned to the hotel and organized some gear for the morning. I don't think I had ever looked more forward to sleep than I did that night. A pull-out sofa bed has never felt so good! Ever wonder why large format photographers go under a dark cloth to look at the back of their cameras? It's mostly just to look super cool. However, a secondary benefit is that it makes everything dark so we can see the ground glass on the back of the camera. This "screen" is how images are composed, but it's not as straightforward as it sounds. For one thing, the image is reversed and upside down. The famous Moulton Barn with the majestic Grand Tetons in the background. Above, on the left is how the image appears on the back of the camera. On the right is what the scene looks like in real life. You can see how composing an image can be a bit of a challenge. With a bit of practice, however, the image orientation becomes less of an obstacle. In fact, you would be surprised how quickly you adapt to composing this way; there are even some cases when I consider this method of composing superior. For example, I tend to notice distracting elements on the edges of the composition more when the image is oriented this way . 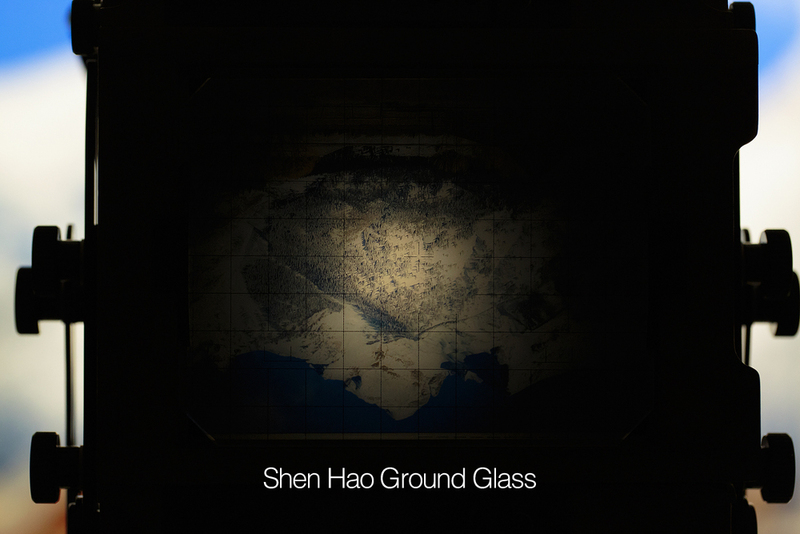 A bigger obstacle to composing comes from the ground glass itself. It is often dark...very, very dark. Several things can affect this: the scene you are photographing, the lens you are using, and the quality of the screen itself. Dark scenes can often be difficult or even impossible to compose depending on just how dark it is. This makes sunrise shots especially challenging as you are often composing in darkness and waiting for the light. The lens being used also plays a significant role. While composing, the lens is left wide open to let in as much light as possible. Faster lenses are preferable as they are brighter, and in large format world, f/5.6 is considered fast. However, even a fast lens must be stopped down eventually to obtain adequate depth of field. Obviously, as you close the aperture, the image darkens...no matter how fast your lens is to begin with. Which brings us to screen quality. All screens will be brighter in the center and then fall off as you move away from the center hotspot. This light falloff can often be quite dramatic (as you'll see below) depending on the quality of your screen. Can you imagine composing an image without being able to see the entire scene at once? This is often an obstacle that large format photographers face on a regular basis. And so it was with my camera. The two places I photograph most often, the Smoky Mountains and Zion National Park (you know, just like everyone does) are filled with many dark compositions. Combine that with the fact that, after some research, I discovered my Shen Hao camera comes with about the worst possible ground glass ever made. After nearly a year spent guessing at both composition and focus, I was becoming frustrated with the results I was having. Both of my lenses are blazing fast f/5.6s. It was time for a new screen. But where to start? It's not like you can pick these things up at Wal-Mart! Although I do think it would be a bit humorous to go into the electronics department and ask for a ground glass for my camera...well, maybe only humorous to me. Anyway, to the Internet I went. After a bit of research, it was clear that there was one screen to rule them all: the Maxwell Screen. Stories of this screen were the stuff of legend. There were rumors of photographers composing images BEFORE the sun came up! Unheard of! I knew I had to have this immediately. However, it wasn't quite as simple as placing an order and waiting for delivery, because...wait for it...Maxwell Screens does not have a website! I didn't even know that was possible in this day and age! Some more research got me an email address and phone number (which I will happily share to anyone who is interested). I sent an email to Bill Maxwell, and he responded a few days later requesting we talk over the phone. This was expected as all the forums I read had said Bill will want discuss options with you to make sure you have the best screen possible. They also said Bill will want to talk...quite a bit. I must say, though, that I did not find this to be the case. Certainly Bill was very thorough in describing how the screens work and the different options available. From speaking with him, I learned that Maxwell Screens are actually extremely high quality fresnel lenses combined with a ground surface. The design of these screens is basically a compromise. As the screen gets brighter, you sacrifice directionality (Directionality refers to looking at the screen at an angle versus directly in line with the screen. The brighter screens have a much smaller viewing angle.) In the end, I decided to go with their brightest screen, the Hi Lux Ultra Brilliant Matte. At just north of $500, this was a difficult pill to swallow, but I reasoned that I had to see what I was shooting in order to make all of this worthwhile. In related news, I am now MUCH more careful about how I pack my camera on trips! A few weeks later, my screen arrived and I set about installing it. The screen actually comes in two pieces: the Maxwell Screen itself and a protective glass screen that goes on the outside. Installation instructions came with it, and it was quite straightforward. First, I unscrewed the brackets holding the old ground glass in place and lifted it off the wooden rails holding it. Next, I placed the Maxwell Screen on the wooden rails with the ground, matte surface facing the lens and the concentric circles of the fresnel facing the back or viewing side of the camera. Finally, I placed the protective glass sheet on top of the screen and replaced the brackets. One note about the brackets, as Bill told me during our phone conversation, on Shen Hao cameras they'll have to be bent a little bit (see video). This is due to the fact that to begin with they were only holding a single piece of glass in place. Since the Maxwell Screen consists of two pieces, the arms of the brackets will have to be bent a little bit to accommodate the added thickness. Best money I've spent in large format, and it's not even close. First, I'll let the below images speak for themselves. To conduct this test, I focused the 4x5 camera on a picture I have hanging in our basement. The picture itself is illuminated with overhead lights, and there is no ambient light in the room. I placed my digital camera on a tripod, and the exposure remained constant in each test. Furthermore, neither the 4x5 or digital camera was moved so directionality remained the same for each image. I tested three screens: the original Shen Hao ground glass, the Shen Hao gg w/a generic fresnel lens, and the Maxwell Screen. None of these images have been edited. Worth every single penny. Just look how bright and evenly illuminated! Even to the far corners. I have used this screen for almost three months now, and I can tell you that it is as good as advertised. On my trip to Zion, I had absolutely no trouble photographing Subway and the Narrows, two notoriously dark locations. I could easily see into the corners, even when stopping down. It was really a joy to focus and compose with this thing! There are several considerations though. First, the Ultra Brilliant screen I ordered is VERY directional. Even straying a few degrees off center will completely black out the screen, as seen in the video. Second, there is a "sweet spot" when viewing the screen. It is approximately two feet behind the camera. Viewing here lets you see the entire image. As you move closer, it starts to get dark at the edges. I found myself composing the entire scene from this "sweet spot" and then moving in closer to check for focus. Also, I was a bit concerned about the fresnel lines and being able to focus, but the image is so bright that this turned out to be a non-issue. Finally, you'll still have to use a dark cloth. Not because of screen brightness, but because of how shiny and reflective the protective glass is. Without a dark cloth, you'll just see a reflection of what is behind you. Hello! Welcome to my corner of the Internet. 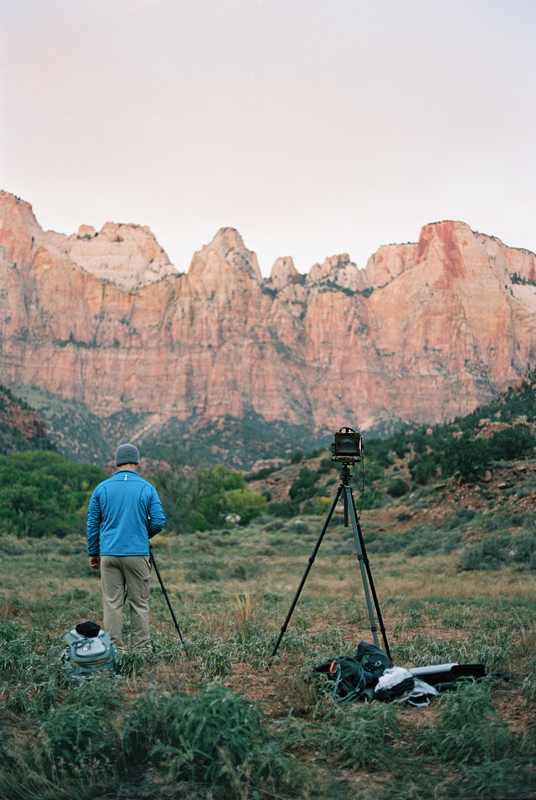 I thought I would begin my blog by recapping what led me to become a large format photographer...since it's not everyday you see someone lugging around an old-school wooden camera. Large format is bulky. I shoot a 4x5 camera, the smallest of the large format cameras, and with all my gear (film holders, tripod, lenses, etc.) my pack still tips the scale at just under 45 pounds. Obviously, the weight goes up significantly as you move up in formats. I once held an 8x10 camera that the owner described as "not that heavy." Yeah, right...the camera alone seemed to weigh almost as much as my entire setup. Note to self, do not trust Ben Horne when he says something is not heavy. How I train to go on long hikes with lots of gear. Large format is slow and time consuming. Although I have never timed it, I would estimate that it takes me about 15 minutes to arrive at a location, unpack, set up, compose, focus, and meter. Truthfully, even 15 minutes would make me feel extremely rushed, and feeling rushed is something I absolutely detest when I'm shooting. More time is always better, which means it is often impossible to spontaneously shoot a scene without being familiar with it. An area, and more importantly the lighting in that area, must be scouted ahead of time, and this means more time in the field. Large format is limiting. My favorite film, Fuji Velvia 50, has about five stops of dynamic range...and even this might be a bit generous. By comparison, the new Nikon D810 (a VERY impressive camera by the way) has about 12-13 stops at its lowest ISO. Shooting a bright sunrise and trying to retain details in the foreground with Velvia 50? Don't even think about trying it without the help of graduated neutral density filters, and in that case, I hope you have an even horizon. Of course, other films have more range, but this comes at a sacrifice of the brilliant colors of Velvia. I haven't even mentioned things like loading film, messing up (which I still do with alarming frequency), and cost. (Velvia 50 is about $8 per shutter click; I don't even want to calculate what it is for you 8x10 guys!) So, why go through the trouble you may ask. My journey into large format began a little over 2 years ago. I was reading a Popular Photography article on Rodney Lough Jr., and in the article was his image called "Vortex." There was just something about it, even in magazine print, that set it apart. I knew I could never recreate this with my digital camera. I would later learn that what I was seeing was tonality; more on that in a bit. I did a little investigation and found out that Rodney used something called a large format camera. At the time, I knew there was a such thing as medium format and that it was obscenely expensive. And now you're telling me there is something bigger?! The camera backs must cost half a million! Another Google search showed me what LF actually was, and this piqued my curiosity. I was surprised that these cameras were even still in existence, and further surprised that they weren't all that expensive. A little convincing of my wife Jennifer was in order as she was (rightly) convinced that we didn't need another camera. However, with Christmas coming up, I convinced her it would make a great gift, and on Christmas morning I became the proud owner of a second-hand Shen Hao 4x5 camera. For the first year I owned the camera, I was basically figuring out how to use it. I find it somewhat ironic that the simplest of cameras (it's just a box that holds a lens and film with no buttons) are the hardest to figure out sometimes. I shot a mix of digital and film as I simply did not trust myself yet with the large format camera. This made for a ridiculous pack, and I often found myself neglecting the film camera for the convenience of digital. However, about 9 months ago I decided to get serious about large format. I purchased Ansel Adams' books The Camera and The Negative and taught myself how to shoot and develop black and white film. I also started taking short day trips in the Smokies with only the film gear; after all, you can only shoot what you have with you. I haven't used a digital camera to take a landscape image in over a year now, and I can honestly say I'll never go back. So, here is why I shoot large format. Image clarity immediately jumps out at you when you're shooting large format. The detail that a 4x5 inch sheet of film can capture is truly astounding. The above image, Heaven's View, was taken from the top of Angel's Landing. It was taken with my wide angle lens. The Temple of Sinawava in the distance (inside the box) is 1.1 miles away (thanks Google Earth). There are 3 cars and 2 shuttle buses parked there...and a bus on the way. Also, there are 13 people standing in the Scout's Lookout area. At 100% magnification, it looks like one of those people is bent over tying their shoes; I was unable to make out the brand...:) And this is all from "just" a flatbed scanner. Truly remarkable detail and image quality. Clarity and detail are nice, but alone they will not make an image. After all, Ansel Adams himself said, "There is nothing worse than a sharp image of a fuzzy concept." Bring in large format tonality. Tonality is difficult to explain, but you'll know it when you see it. There's just something about the colors and the way light areas transition to dark that gives a large format image a certain look. It again relates to the real estate that the image is recorded on. With such a large sheet of film, colors and tones more naturally transition. I wish I could explain it better, but it is a difficult concept to describe. And while it looks good on the Internet and even better in Photoshop, it is truly magical when seen it in a large print. And viewing it on a light table through a loupe? An absolute religious experience! You are transported into the scene in an almost 3-dimensional way; it feels as if you are really there. No digital camera or any amount of processing can recreate this. In addition to going strictly large format this year, I also decided to develop my own black and white film. It's really not that hard or expensive, and there is something special about seeing an image on the film and knowing that you were responsible for creating it every step of the way. It's the complete opposite of a digital camera where the image is a more theoretical sequence of 1's and 0's (to be fair, it's often a very beautiful sequence of 1's and 0's, but still...) When I'm finished developing, I can literally hold an image in my hand that I made. There's something very powerful about that. Also, I mentioned that Velvia is a very "narrow" film. This is absolutely not true with black and white film. Notice in the above image you can see details both in the darkest shadows and the brightest clouds. Its dynamic range rivals that of today's top end cameras...so it's got that going for it. There is also extreme freedom when shooting black and white film. For one, it opens up opportunities to shoot in the afternoons, something often not possible or desirable with color film or digital. The harsh shadows we try so hard to avoid with color provide much needed contrast and interest in monochrome images. Second, there is much more latitude to express creativity in black and white. Whether using filters pre image or dodging and burning following development, there is much more leeway for "editing" while still creating a pleasing image. This is directly related to the fact that black and white is not recreating something that is actually there. It's a monochrome image of a color subject so our brains already accept that some form of image manipulation has taken place. Therefore, when viewing black and white we can accept further departures from reality than we do when viewing a color image. Of the reasons that I have mentioned, "the process" is by far what I love most about large format. By "process", I am referring to everything that goes into making a successful large format image from start to finish. I began this post with all the difficulties that large format presents. And while it can be frustrating at times, it makes a good image that much sweeter in the end. No pain, no gain. With every single image I take, there is the struggle just to get the gear there. Once I've arrived at the scene, there are the problem solving aspects of 'seeing' the final image, composing that vision both upside down and backward, choosing the correct film for the job, and then calculating exposure. Once I've taken the shot, there is always the anxiety of wondering if I messed up somewhere along the way. To me, these difficulties make a successful image exponentially more gratifying than any other format. Instead of bemoaning the fact that I sometimes have to spend hours at a location to wait for the right moment, I use that time to really soak in everything I can about a place...the sights, sounds, even smells. This allows for a MUCH more immersive wilderness experience. And while science has proven that time actually moves slower when you are waiting for film to return from the lab, opening your developed film is like getting a gift at Christmas. The time spent waiting allows memories of the images to fade a bit, so when you open them it's like you're seeing something for the first time. At this point, shooting anything else would just feel hollow to me. I am a large format landscape photographer, and I always will be.